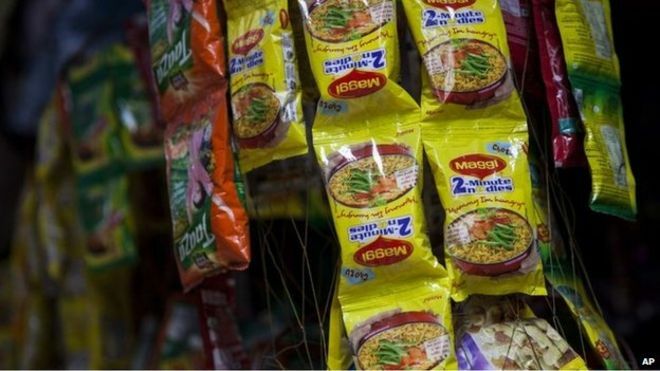 Nestle says it will destroy more than $50m (£32m) worth of its hugely popular Maggi noodles, following a ban imposed by India’s food safety regulator. India’s food safety regulator says tests have found the instant noodles “unsafe and hazardous” and has accused Nestle of failing to comply with food safety laws. The company insists that the noodles are safe and is challenging the ban. Nestle has 80% of India’s instant noodles market. The company said in a statement that the value of withdrawn noodles include stocks taken off the shelves and stocks stored in factories and with distributors. Earlier this month, Nestle began withdrawing the Maggi brand from stores, after regulators said they found higher-than-allowed levels of lead in some packets. The company is challenging the ban in the high court in the city of Mumbai and “raised issues of interpretation” of India’s food safety laws. Nestle’s global chief executive Paul Bulcke has asked to see the results of the laboratory tests and promised to return Maggi to store shelves soon. Several states have also been testing the noodles for the chemical monosodium glutamate, widely known as MSG.